Social commerce has taken on many forms; from purchasing items on Facebook to product recommendations from your social graph to daily deal sites. There are plenty of startups that offer the functionality listed above, but there’s one area of social commerce which no startup has yet to conquer and successfully take on Amazon and eBay—the marketplace. 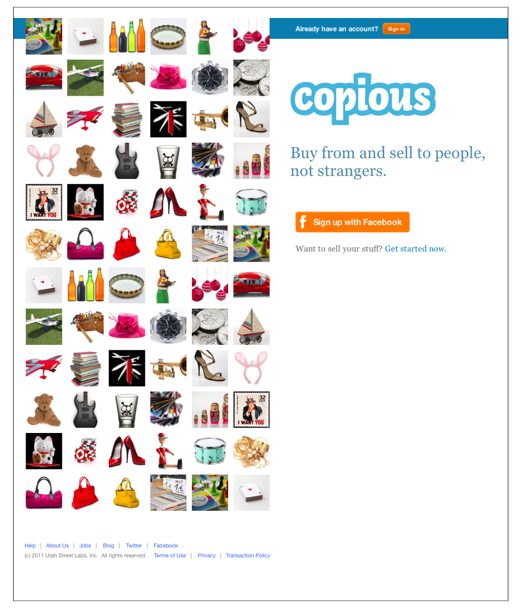 Today, Copious is launching an eBay-like marketplace that leverages your social graph on Facebook. Copious, which has raised $2 million in funding from Foundation Capital, Google Ventures, BlackBerry Partners Fund, and a number of Facebook angels; is trying to disrupt the marketplace industry in a number ways. First, the site allows buyers and sellers to see if friends in common, which friends have bought or sold from a seller, bought from you, etc. As Copious co-founder Jonathan Ehrlich tells me, the site is centralized around using social data as a signal to help users understand and trust other parties. Another component of the marketplace is that sellers can integrate a variety of content and social components to show communicate their expertise, whether that is a Twitter account with thousands of followers or an eBay account with positive reviews. And lastly, the site aims to give buyers a more personal, relevant experience with recommendations and more. Here’s how the site works: The marketplace acts similarly to eBay, in that everyone creates a profile and can then search items to by and/or upload product to sell. All buyers and sellers on Copious are linked to their Facebook identities. For example, buyers can see whether anyone in their networks has purchased, shared, or commented on an item from a specific seller. They can also see more information about a seller, rather than just anonymous aliases or profiles. Using a proprietary set of ‘signals,’ Copious allows sellers integrate information from profiles on Twitter; other marketplaces like eBay; relevant product forums; personal blogs; and more. Copious will also recommend product to buyers based on their “likes” on Facebook and what their friends have bought. Copious will also allow sellers to integrate a social pricing mechanic that enables a seller to offer buyers discounts for sharing listings on Facebook and a following mechanic that enables sellers to offer buyers discounts for following them on Copious. For example, seller x could offer me a $25 credit to purchase a handbag if I follow the seller or share the listing in my stream on Facebook. While Copious does not charge sellers a listing fee, sellers are charged a flat transaction fee of 10 percent (discounted to 3.5 percent for a limited time following launch). For basis of comparison, eBay charges a small listing fee and transaction fees range from 8 to 12 percent. To prevent any sort of theft on the marketplace, Copious serves as an intermediary on all transactions. The money paid to a seller is held in escrow until the buyer receives and verifies the shipment. The Copious marketplace is launching with a select group of sellers, focused initially on the handbags category and featuring sellers like eBags, Malababa, Ritzy Ragz, and more. The site will eventually expand to other categories such as electronics and clothing. Copious was founded in January 2011 by former Mobshop CEO Jim Rose, Critical Path VP of mobile strategy Rob Zuber, and former Facebook head of marketing Jonathan Ehrlich. All three worked at MobShop, which was a group-buying site that launched during the bubble, way ahead of its time. While Facebook currently has its own marketplace (powered by Oodle), Ehrlich says that this model has flaws because it focused on selling between friends and locally, whereas Copious is focused on adding social relevance to selling (even if you don’t know who the seller is). Of course, launching a full marketplace has its challenges, as eBay and Amazon knows. It’s not just about verifying seller quality, but it is also a challenge to make sure that the items sellers are selling are authentic. 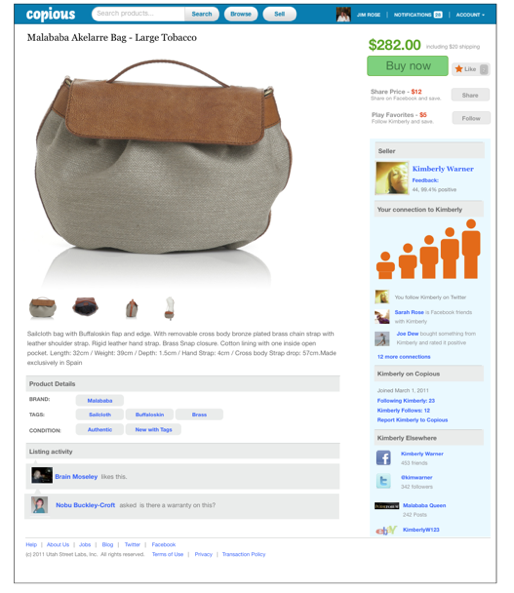 The startup says that it will bring on handbag experts to help authenticate whether handbags sold are fake or real. To be perfectly honest, I never check Facebook’s marketplace (although I get plenty of emails alerting me to items on sell within my social graph), so I’m curious how much traction the network is seeing with its marketplace. It’s unclear yet if Copious has the answer to blending social with a marketplace, but they certainly have the potential to disrupt the social commerce space.